His senses expanded over the lands searching for Xin-Yin. Where was she? He flew lazily toward the distant lights. He and Xin-Yin had parted on a quarrel. She had wanted to see distant lands, and Yangshao had wanted to gaze always on the Xiao Hinggan mountains of his birth. Their words had wounded. Xin-Yin accused him of fear, of letting the draining ages make him weak, like a stagnant pool poisoned with its stillness. Yangshao had blasted her with his hot rage, calling her disloyal and a cruel betrayer. On waking, her absence was a hole in his heart, an empty place of wanting. He regretted his bitter words. The passing centuries had shown him that he had misjudged her. He no longer heard her voice. His ears filled only with the sound of the howling, Siberian wind. His wings took him over lands he remembered as bare taiga and farmland, but now he saw houses and roads. The closer he came to the colorful lights, the more tightly packed and larger were the houses. Louder grew the bangs that preceded the dazzling bursts of color, like the night sky was filled with the wings of a hundred phoenix, their feathers drifting to earth in ashes after the colors faded. Then another bang, bang, bang and more arching colors filled the sky. He remembered a small village here on the bank of the Songhua River, but now he saw a huge city of over five million people, crowned with wheeling fireworks. Yangshao saw enormous buildings, a rainbow of colors glowing from within them. He landed on a tall icy tower and was amazed to see the buildings were made from blocks of ice. Yangshao thought back to a small village ice festival a thousand years before. The villagers had frozen water in buckets and chiseled out room for a candle, then had made walkways of the lanterns, sharing tarts of black currant and linden honey. “Mom, Dad, look at the dragon sculpture!” Yangshao’s golden eyes saw a small girl pointing at him. “It looks like solid gold in the light!” Her parents did not even look. Her father was eating a steaming sausage. Her mother tugged at her hand without turning around, and she followed them sadly, pausing to smile over her shoulder at Yangshao. “A phoenix!” The little girl’s voice sounded once more, but again her parents did not look. Yangshao looked instead, and he saw an ice sculpture of Xin-Yin, illuminated by blinking red and orange lights. Yangshao knew it could not really be her, it was much too small. Xin-Yin had filled the sky with her magnificence, Yangshao remembered, her shining eyes had made the stars seem dim. Sighing with longing for her, his gaze wandered around the park, looking for her, but as far as he could see, it was filled with colorful castles, towers and statues of animals from around the world. Yangshao could see horse-drawn carriages, and hundreds of people walking, bundled up to their noses in thick coats. “Yang, Yangshao,” he thought he heard, over the tumult of carriage wheels and chattering people. His spirits rose, and he followed the thin whisper to the white-shrouded Songhua River. With a few brief flicks of his magical tail, and he found a thinner spot, where blocks of ice had been carved, and he broke through, splashing into the azure river, diving deep down into the seaweed. The light sweet voice of Xin-Yin called him, lured him up river and behind an icy waterfall where the rocks sang to him. Xin-Yin had left her voice there in the river near his sleeping place under the taiga, to call ceaselessly for Yangshao down the centuries. Yangshao erupted from the river, spearing straight up into the sky, veering east toward the great sea. The moon grew brighter when the colorful ice-buildings receded. Above him, three stars east of the moon, he finally found Xin-Yin in her celestial garden. To this day, if you look up, you can see Yanshao’s golden horns and his whiskers of shooting stars where he is curled up, contemplating the Xiao Hinggan mountains of his birth. Xin-Yin’s wings embrace him while her shining eyes delight in seeing all the world. 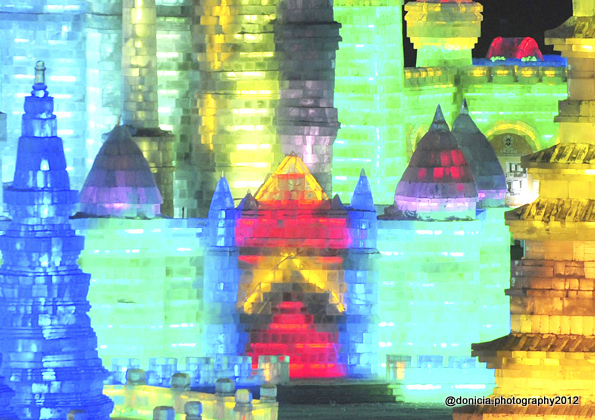 Thanks to Donicia at Donicia’s World for these great photographs of Harbin’s 13 International Ice and Snow Festival. Harbin is China’s northernmost city, and is often called the pearl beneath the neck of the swan-shaped province of Heilongjiang. It’s also referred to as the Ice City, because of it’s long winters. Since 1985, Harbin has hosted China’s original ice festival, starting January 5 and lasting over a month. Historically, ice was turned into lanterns by freezing the water in buckets and chiseling out a place for a candle, the ice keeping the wind away. How does Harbin look in Chinese? A charming story, Brenda. Myth and romance and ending together three stars east of the moon. You’re welcome. I’m honored to just share my photos to a beautiful and inspiring story! Thank you for making me a part of it. That’s very huge for me 🙂 Peace and Joy to you and yours as well. You understood! It’s wonderful to be understood! A wonderful read. Loved it! Thanks, I am so happy you think so! I really enjoyed reading this. Thank you for your visits… I am lost in a sea of comments that I can never seem to catch up on. Jules, No worries. I don’t have a score card. I just call ’em like I see ’em and move on. I am working on a new story. I always love my newest story best. I guess that makes me fickle. LOL I truly, deeply, madly love this!! That last line is brilliant! I adore this haiku from start to finish of course. Ever think of submitting your work? There’s this really nice haiku publication called Acorn. I highly recommend you send some of your work to them. They accept poetry via e-mail. Oh, I’m so pleased! I worked hard on that coloring page. LOL It’s not my strong point. I hope your grandkids like it! i’m sure they will as well as my kinder class. and me too. i love to color. Fantastic. Your writing is such an inspiration. Thanks for sharing. I’m glad you are still reading on your journey. This story has a special place in my heart. I would never have written it if I hadn’t started blogging. Of course, reading will always be a first love of mine. And I understand about that special place in the heart. You are right about that, blogging does provide so much fuel for the writing fire. Please tell me that this photo is of the mythical promised land of Elysium! Is Elysium in that new Jodie Foster movie? I haven’t seen that yet. Was it good? The photos are from the Harbin, China, Ice Festival last year, as taken by Donicia. What a lovely and powerful story of friendship. Absolutely loved this one! Thanks! And thanks for the link on your site, too! Oh this was so delightful. I felt like a child reading it. ha Probably but it was all so great. Loved it.